Pete Johnson has done something in the cigar industry that not many people have. He’s made a quality cigar that’s quickly shot to the ranks of top scoring by cigar magazines across the board. Reviewers love his cigars, smokers love them, and now you’ll find out that I love them. I had my first Tatuaje a week ago at the Occidental but I purchased the Artistas at Grants in San Francisco. I was hoping for something like La Riqueza (which i’ll review shortly) but what I got in the first third of this Nicaraguan puro was a nice spice. Upon lighting, the pre aroma brought out spice and sweetness. The smoke wasn’t so thick like a Padron. The draw easy, the construction, solid. I had an inch of bright white ash before it fell off. And it burned pretty quickly. The first third hit me with spice and sweetness. The next third had an oiliness I’ve grown to associate with La Riqueza that can only be described as just..yum! The last third had for me a combination of the two, but tasted so good that I smoked it to the nub. Blended in the style of the flavorful yet Medium Bodied Cuban Cigars. Cigars are rolled in Nicaragua using select Nicaraguan tobaccos and classic cuban blending with a beautiful Cuban triple-cap. Staying true to the pride of El Rey de Los Habanos. I picked this up for a little over $8 and my only regret is I didn’t get two. 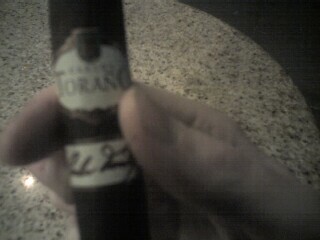 Even the one I smoked yesterday with my crappy cold affected palate picked up on the nuances of his well crafted cigar. I enjoyed this cigar with a glass of Glenfarclas 12 year single malt Scotch. The pair worked well together because the scotch is not overpowering and nor is the cigar.